Beautiful private setting! This 1840 sq ft bungalow sits tucked away in the trees surrounded by 14.25 acres of beautiful land! Featuring 2 bedrooms on the main floor, 1 more in the basement and 3 bathrooms. The master bedroom enjoys a large ensuite with jacuzzi tub and separate shower, there is a door leading from the master bedroom to the All season sunroom complete with hot tub! Oak kitchen with eating bar and large breakfast nook overlooking the living room which features a corner gas fireplace. The basement is mostly finished with a bedroom, family room, second kitchen, 3 piece bath, loads of storage and heated floors! There is a triple 28 x 31 ft attached garage, fully finished and heated PLUS an additional 4 car detached garage! There are 2 water systems for this home, cistern AND well. Property is fenced and cross fenced with central water bowl, 30 x 40 2 story barn with power and water. 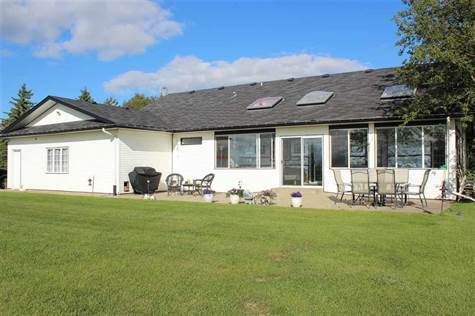 So many more upgrades to mention, book a showing for this beautiful acreage so close to town!